This drill is good pre-season as it develops aerobic fitness through an intense 60-90 second period of jumping up high and bending down low. It's also useful for improving the crumbing skills of taller players. drills for afl players, afl training exercises, aussie rules kicking drills for for afl players using these skills: ruck. Being the first to the dropzone greatly increases your chance of winning the clearance. This drill has running receivers who kick to marking players at hotspots, then tests the positioning of 4 crumbers. Defensive, Front & Square, Run & Carry, Fun. 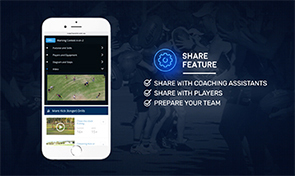 australian rules kicking drills for for afl players with a focus on defensive, front & square, run & carry, fun , free kicking drills for for afl players, australian rules coaching drills. 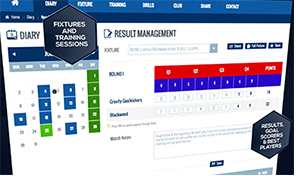 Hard, physical competitive training is sometimes needed to make players match hardened, and is often required following a soft loss. This drill encourages hard attack on a contested ball, with teamwork required to score under pressure. Correct positioning front and square in front of a marking contest is a skill; players must be first to the drop of the ball when it spills to regain possession. This drill practices accurate disposal and gut running to the correct position for the next contest. Kicking, Handballing, Crumb, Mark Contest. 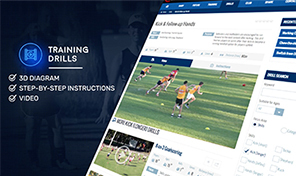 australian rules handball drills for for afl players with a focus on front & square, hard running , free handball drills for for afl players, afl training tips. When a player is within goalkicking range, they need to quickly sum up their distance and angle to determine whether a shot on goal is the better option, or a pass to a leading forward is preferable. This drill makes players pick up a loose ball and decide upon the best action. Decision Making, Run & Carry, Forward line delivery, Goalkicking, Gameplan/Strategy. drills for afl players, afl drill, aussie rules rucking drills for for afl players using these skills: long kick, long handball. When running the ball out of defense, movement to the open side is the clearest path to goal. This drill has various stations with 2 running players as options for a marking player, simulating transition from defense to attack. Skills under pressure, Defensive, Hard Running, Front & Square, Decision Making, Run & Carry, Forward line delivery. 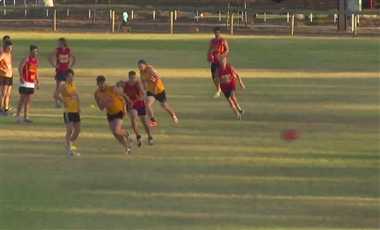 australian rules rucking drills for for afl players with a focus on skills under pressure, defensive, front & square, run & carry, decision making, forward line delivery, hard running , free rucking drills for for afl players, afl training routine.